Slovak sacred songs, which from earliest times have been imbued with elements of folk music, may be considered the most significant sphere of musical work created on the territory of Slovakia. Their remarkably developed genre displays a rich variety of melodic and compositional forms that evolved in course of centuries. They were preserved in numerous hymnals and song collections, dated mainly from the 17th century. 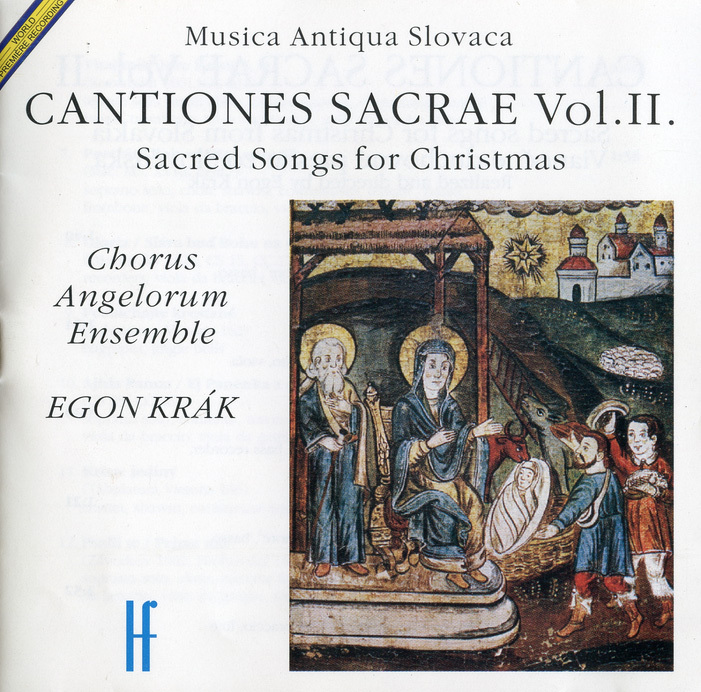 Slovak sacred songs contain not only features of Reformation chorales, hymns and responsoria, but also traces of earlier medieval music. Attributes of Franco Flemish polyphonic innovations, “musica ficta”, and late Renaissance dance music are also in evidence. This demonstrates a close connection with major centers of European music, such as Italy, France, Flanders and Germany. Despite the fact that sacred songs from the territory of Slovakia demonstrate a great variety of composition and melody, they have until recently remained a little known genre. Although many characteristics of sacred songs disappeared by the 19th century, they influenced later liturgical music. 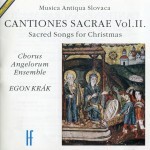 All sacred songs that have been reconstructed in this recording, are representative of the songs celebrating the cycle of holidays from Advent to Christmas. By their nature they range between folk songs and polyphonic music. We attempted to approximate as much as possible the authentic form of each sacred song whose charming hybrid character permits various interpretations. In each case we strove to preserve the vocal and instrumental arrangement of the period. At the same time we tried to emphasize the beauty and unique character of the songs. In some cases for Christmas songs and carols that have survived until the present time, texts dating from a later period were employed, since these remain part of Slovakia’s cultural heritage. To this day, the joy and spirit of Christmas still reverberates in the expressive music with which our ancestors celebrated the birth of the Savior. founders was not only to perform music of 15th – 17th centuries, but also to revive old music preserved in Slovakia in its authentic form. 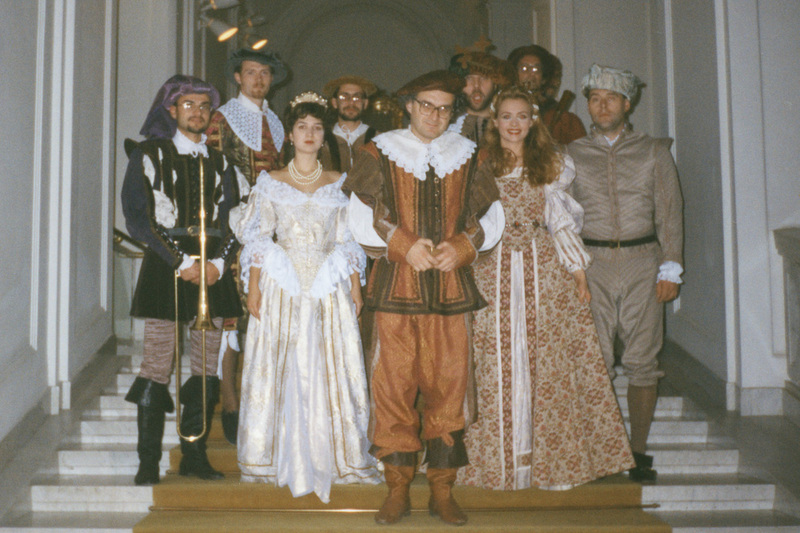 Their first presentation of sacred songs from the territory of Slovakia was released in 1996. The Chorus Angelorum Ensemble brings together singers and musicians who share a natural affinity for performing old music on copies of historical instruments. It is an international ensemble composed of leading musicians from Slovakia, the Czech Republic, Germany and Russia. Each of them is a specialist in his own right and all of them participated in the recording with great pleasure, creating the authentic atmosphere of bygone times. A sacred song is a combination of music and text with some religious content. In the past, the sacred songs were sung throughout the whole church year. They enjoyed a wide popularity and have been preserved in various versions, reflecting the different stages of their development. The songs performed at Advent, Christmas, Lent, Easter, Ascension, Whitsuntide, and on Corpus Christi Day have each their special character. To harmonize with the liturgy, the songs were alternately grave, jubilant, joyful, or even dance-like in character. In their various forms they reveal the fine sense of beauty and spiritual attainments of our ancestors. They exude the sublime meekness, pathos and joy, wisdom and belief in the presence of God. Some of them are real music gems. Their structure consisted of elements derived from both secular and sacred cultures. They are mostly in the form of a chorale, some of them are antiphonal, psalmodic or hymnic in nature. The medieval, renaissance and baroque songs demonstrate the exceptional creativity of the Slovak people. These sacred songs, worshipping God and Christian tenets, do not belong only to the precious legacy of the church music but, due to their high artistic level, to the general music heritage. They represent the important examples of the art of music in Slovakia. The vocal and the instrumental parts of the songs presented on this CD have been restored strictly according to the specificities of their original style. Realization and texts by Egon Krák. The Chorus Angelorum Ensemble was founded by a group of young musicians under the direction of Egon Krak. The initial aim of the founders was not only to perform music of 15th – 17th centuries, but also to revive old music preserved in Slovakia in its authentic form. 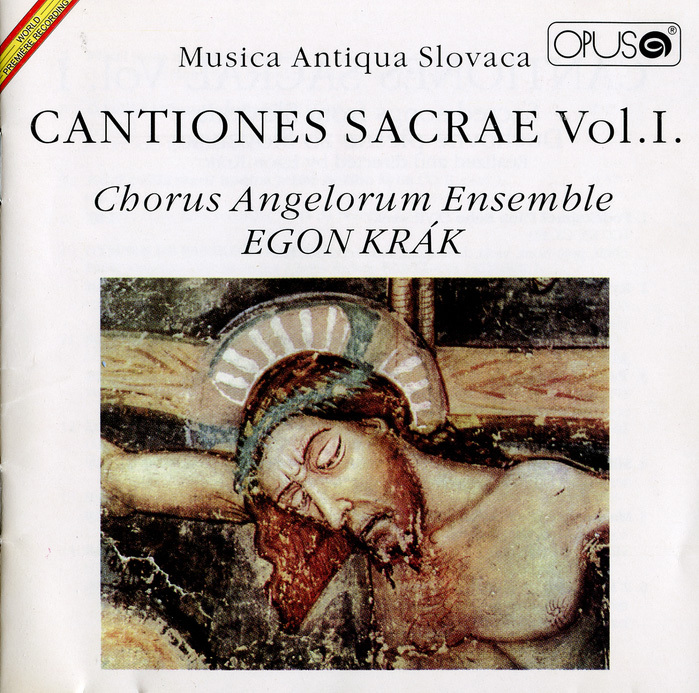 Their first presentation of sacred songs from the territory of Slovakia was released in 1996. The Chorus Angelorum Ensemble brings together singers and musicians who share a natural affinity for performing old music on copies of historical instruments. It is an international ensemble composed of leading musicians from Slovakia, the Czech Republic, Germany and Russia. Each of them is a specialist in his own right and all of them participated in the recording with great pleasure, creating the authentic atmosphere of bygone times.